For a scenic drive and interesting art experience, head for the Enchanted Highway near Regent. 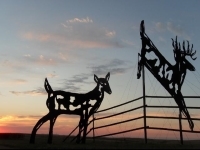 The numerous whimsical metal sculptures along the road include The World's Largest Tin Family, Pheasants on the Prairie, and Fisherman's Dream, and are all constructed by artist David Greff. Miniatures of each sculpture are available from the gift shop in Regent. Opening times: Gift shop is open 9am-6pm.